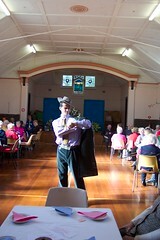 We had an Op-shop fashion parade to day at church. I wore I few smashing outfits from the op-shop. After the parade we had lunch. The parade was to raise money for Operation Christmas child. You are so HOT right now! When i did Blue Steel I had old ladies in walking frames running after me!